Did you know that as demonstrators we receive a magazine every couple months full of business tips, project ideas and even a couple workshops planned out for us?! It's an awesome resource available exclusively to demonstrators. 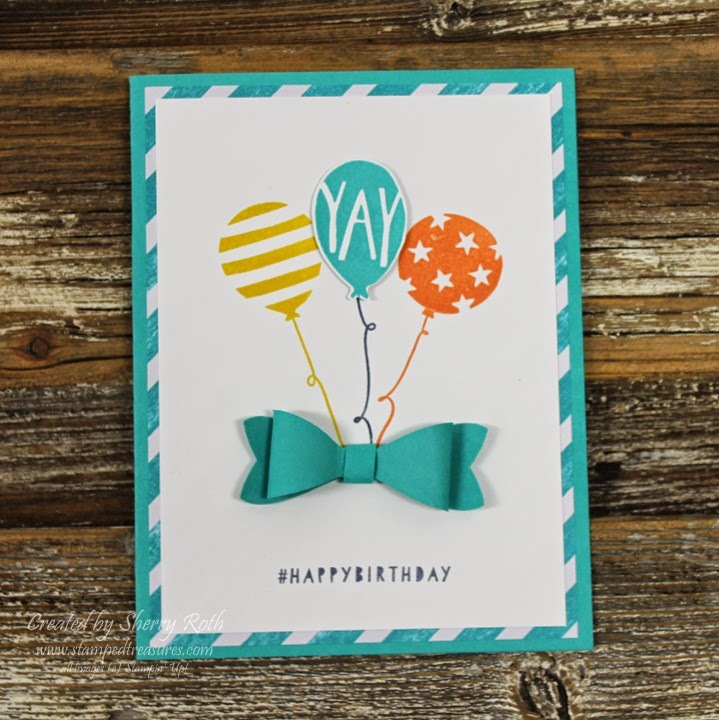 This card is one of the cards that I copied right from that publication using, once again, one of my favorite sets - Balloon Bash. Isn't it adorable? And check out that bow - it was created using the new Bow Builder Punch. Which I must say has been my biggest seller since the Occasions catalogue has been released. Did you know that if you join the Stampin' Up! family during Sale-a-Bration you can add either two Sale-a-Bration products OR a kit from the Occasions catalogue for free? That's on top of the already fabulous starter kit deal of $155 worth of products, of your choice, for only $125 (no shipping/no GST)! If you'd like to receive this exclusive magazine and all the other perks of being a SU! demo you can join the Treasure Stampers team online here - we'd love to have you join us!